Kennebago and its strong bench of surrounding lakes and rivers are legendary among fly-fishermen. 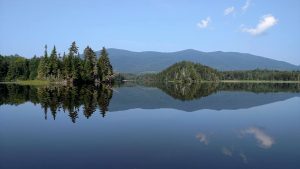 Mainers will tell you it’s where streamer fishing as we know it was born — the lake is known for trout and landlocked salmon, which grow fat and gullible in its clear, clean water. The largest lake to allow only fly-fishing east of the Mississippi, Kennebago is also the last lake to host a fleet of handmade cedar Rangeley Boats, a style of supersized, square-sterned rowboats first built for guided fishing in 1869. Grant’s Kennebago Camps (138 Grants Camps Ln., Rangeley; 207-864-3608) owns the vintage fleet and has hired a boatbuilder to restore the boats this summer.